Any MINIMUM requirement to grow in coco without Liquid Fertilizers & store brought things ? I mean i want to know the minimum requirement to grow PHOTOPERIOD STRAIN & AUTOFLOWER STRAIN...Seprately for both..
E.g coco 1part + perlite 1part + compost 2 part.. Weekly compost layer etc etc. in flower add this and that eetc etc..
can you just quote the information you are referring to you kinda threw a random comment out there with out much details. I have a ? 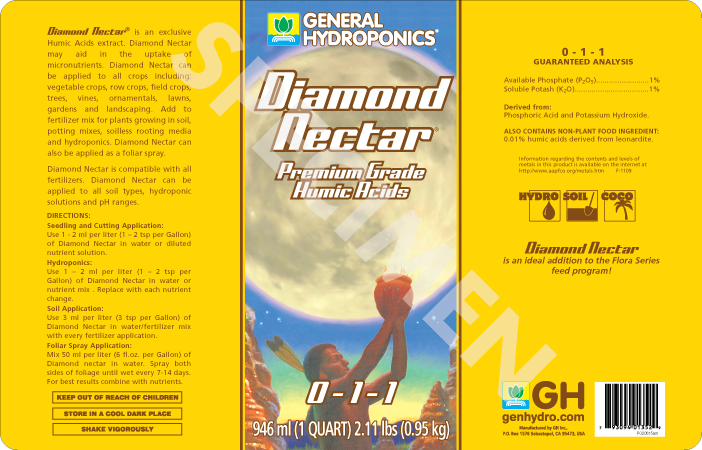 About the GH Diamond Nectar: Premium Fulvic Acid allows the plant to break-down and use nutrients more efficiently. General Hydroponics Diamond Nectar Liquid Premium Organic Fulvic Acid is a fulvic acid supplement that is best used at every watering. General Hydroponics Diamond Nectar Liquid Premium Organic Fulvic Acid is used at 15 milliliters per gallon or 3 milliliters per liter for soil. You may ask if you still have questions about the general hydroponics nutrient line. Good point. It came with NPK raw nutrients, I looked at the website and it looks a tad bit different than the one Dealzer came with. but still. I already wasted and bought the ff nutrients.. that's why i'm asking. 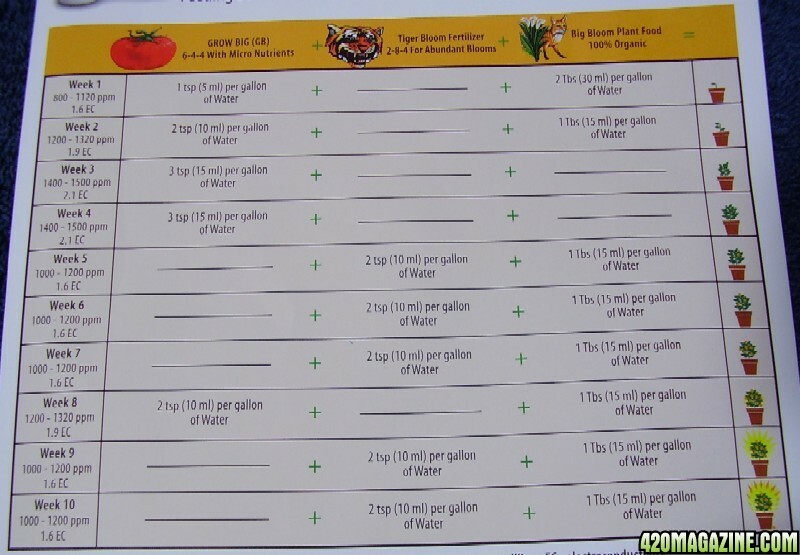 I'm reading the hydroponics nutrient schedule for FF and it looks wayy out of control. I thought 2tsp big bloom and grow big hydro 1 tsp for seedlings was a bad idea?? I've read other posts that said I should start with 1/4 and then work my way up.. i've read other posts that say only use 50%.. I'm tempted to try the hydroponics schedule "as it is" But I don't want to KILL my plants! Lol.... (seriously though) I'm just afraid it'll be too much or it'll kill the plant. I would begin feeding your plants a 1/4 strength nutrient dosage and slowly increase the nutrient strength until you are feeding full strength nutrients. Yellowing and browning leaf tips are a sign of nutrient burn and the nutrient strength should be slightly decreased. How about when I mix up my solution and I have a good bit left over, for coco and pearlite medium, watering a few times a day. How long does my left over water remain good to use? I put a lid on the bucket, which has about a gallon left to still water with. And what causes the PH to rise after sitting? I believe that your already mixed nutrients should remain good to use for 7-14 days, you may have to readjust the pH before use. 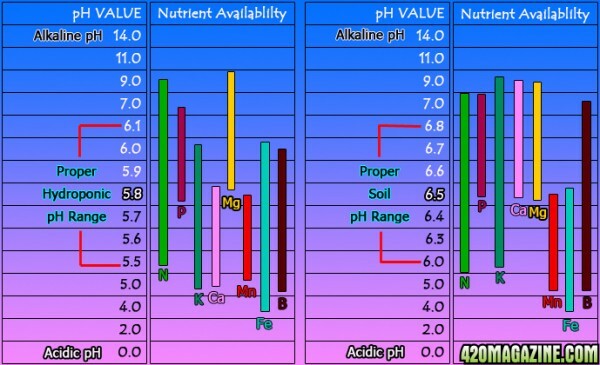 The pH of your already mixed nutrient solution may change on account of the pH buffering effect of calcium in your water source. Although its author BigIrishDoode has passed away the Lets Talk Coco! Organics & Salts thread remains the best source of information for using coco coir for growing cannabis. There is a 3-pack available for $65 of Open Sesame, Cha Ching and Beastie Bloom IF you can find it! The last 4 Products are used in small quantities and only at specific times during the grow -- so if you know someone who wanted to go in on the 3-pack with ya, it would be worth it! At beginning of week 11--Check Trichomes-- Flush if ready.. otherwise, continue as with week 11 every week until you flush! HOPE THIS HELPS CLEAR UP THE "HOW DO I USE THIS" QUESTIONS!!! Can only assume that since this was posted in 2008 things may have changed with Fox Farms. 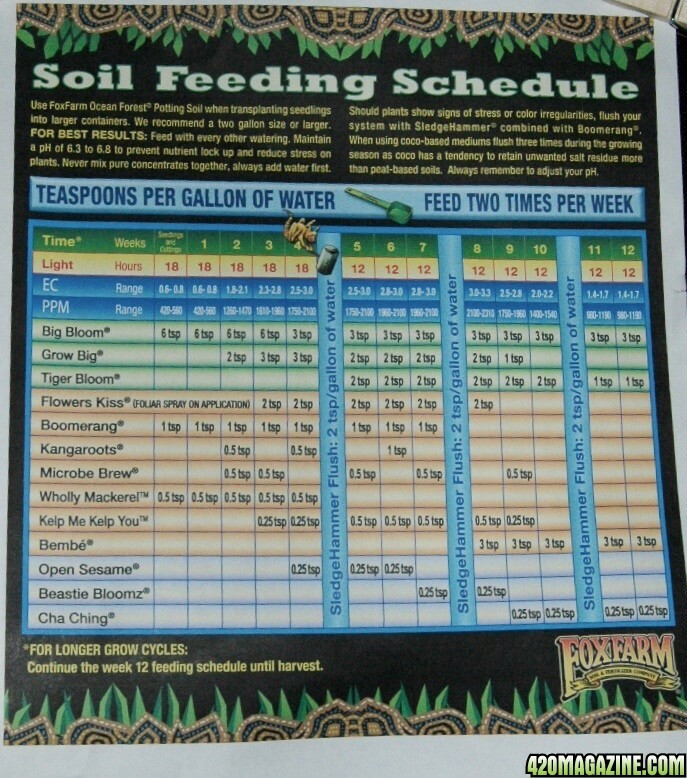 Here is the soil fox farm feeding schedule and as you can see there are a few more items they suggest as well as more flushing then just at the end. 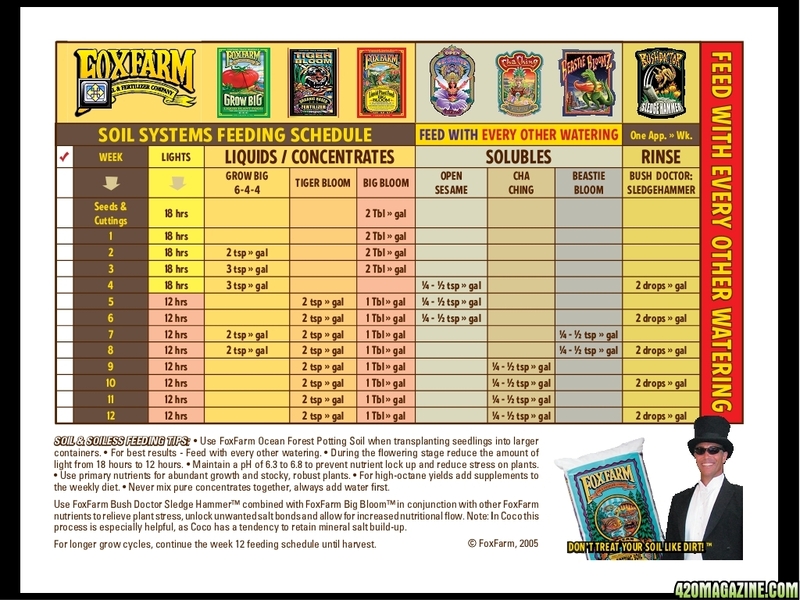 For their hydro schedule you can get it at FOXFARMS.COM Sorry only had the soil one here since I only grow soil right now. How to Grow Marijuana-Everything You Need to Know! Be active, help educate others and promote the cause. Here is a great place to get started. THEN USE THIS GUIDE PLEASE!!! and an empty jug. Mark them (A) (B) & (C) --- (B) is the empty jug! in the 1st jug (A) mix the MG at 1/4 the recomended rate for indoor plants. In the 2nd jug (C), mix at 1/2 stregnth for indoor plants. Now-- when your plants get their 3rd set of leaves, feed once every 10 days. Start with (A) for the 1st 2 feed... then (B).. and end-up with (C) the week before you go 12/12. FLUSH YOUR PLANTS WITH 5 GALLONS OF CLEAR WATER BEFOR GOING 12/12! MG builds up-- and will lock-up as you add the stronger bloom nutes! Do the same with your bloom nutes, Mix ahead in larger amounts... BUT--mix Jug (A) at 1/2 rate, Jug (C) at full stregnth-- and (B) the 2 mixed. then switch to (B). Do not switch to (C) until the week before you flush for harvest! MAKE SURE TO FLUSH WELL AND WAIT THE FULL 2 WEEKS TO HARVEST! You need to flush all the Nitrogen and magnesium out of the plants-- so Flush them well, put back in the bloom room the full 2 weeks till harvest, water as needed .. but absolutely no nutes or foliar sprays! USING MG SOIL IS NEVER RECOMENDED!! it has TIME RELEASED nutes-- so flushing is impossible... and you do not know how much nutes are being released or used by the plants. IF you are one who puts their plants in the dark the last 3 days, give em at least 24 hours under lights before ya do... the photosynthesis will help the plant flush out unused nitrogen. if these happen, flush the plant, and wait 2-3 days before feeding again. If Using MG soil and this happens, your best route is to re-plant in a bigger planter with different soil... DO NOT try to remove the existing soil from the roots of the plant!!!! MG may not be the best-- but it CAN work! FLUSH YOUR PLANTS WITH 5 GALLONS OF CLEAR WATER BEFORE GOING 12/12! Mix Miracle Grow in your jug (A) with 1/4 recommended strength nutrients so for small plants it would be 1/2 of a squirt and large plants 1 squirt per jug. 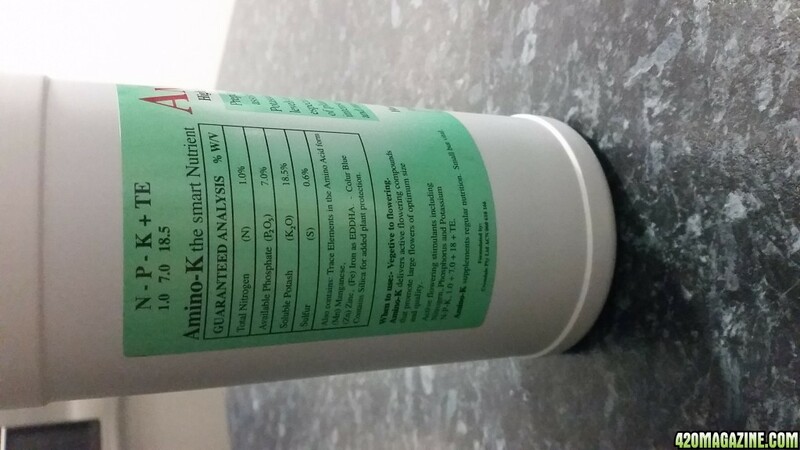 Does anyone no much about a product , Amino K.
Amino K is a flowering supplement that would be best used as a supplement to vegetative nutrients when you are flowering your cannabis plants. How many PPM on a DWC system using RO water? Welcome to 420 Magazine Coachc! What nutrient brand and products would you prefer to use for your cannabis plants? 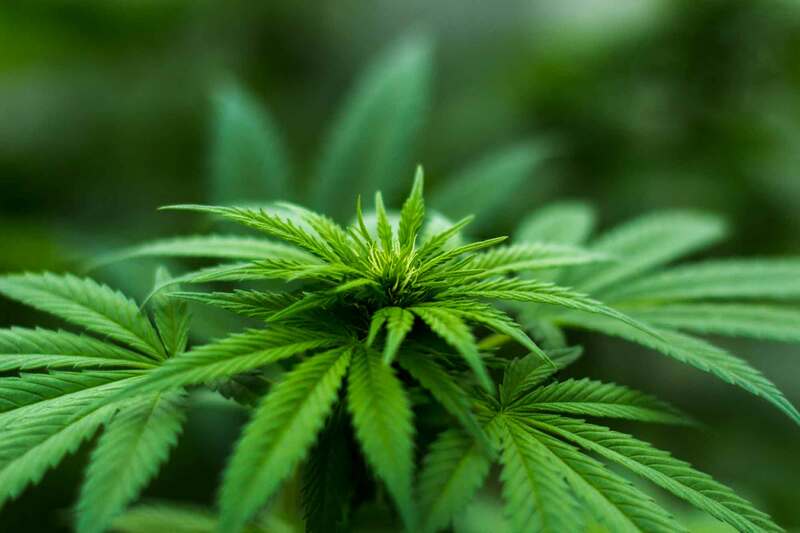 Cuttings and Seedlings 1 milliliter per liter or 3.79 milliliters per gallon, Small Plants 2 milliliters per liter or 7.58 milliliters peer gallon, Mature Plants 4 milliliters per liter or 15.16 milliliters per gallon. I am using the FF organic nuts and following the FF feeding schedule, it calls for much less than those measurements, and I feed only after every other watering. The FF feeding schedule is online and easy to follow, the amounts on the back of the nutrient containers are higher than those listed on the FF feeding chart that is online, I hope this clears up the FF question. Has anyone nailed down a good PHASIC feeding schedule for DaKine 420 nutes? Giving them a try on my first grow and so far finding there amount a bit heavy for the plants. New to dwc here and just got bubbler bucket. I have a new clone been rooted about 3-5days in soil.Do I set it up and the media get moist first of plant dry and let the bubbler bucket saturated from the bottom? I'm wondering what the best way to clean off roots to put in dwc. And when should I start nutes (using DaKine powdered nutes) should I just start with ro water and then in a week do a 25% feeding or 100% any help or guidance in the right direction will be greatly appreciated. I got pro mix bx with biofungicide as my soil and bought the botanicare pro grow and bloom. when should I start adding the nutrients with this kind of soil? and can I grow a good plant with those 2 nutrients? Great question that I was looking for an answer to myself. I'm using FFOF and have seen a number of claims that this will only be able to supply nutrients for part of the grow. Without a solid answer I guess the only way is to watch for nute deficiency then figure out what's going on. edit: OK. Found my answer and I feel dumb. There's a chart on the previous page and here is a link to the FF feeding schedule. It never occurred to me that adding nutrients to a soil that has nutrients would be expected, but apparently FF thinks so. As a new grower who does not have 1000w light, RO water, CO2, etc. I think it should be said that nutrient schedules don't apply to me as well as they apply to those with perfect environments. I have 600w light so I will need somewhat less because I am not supporting the level of photosynthesis to use a full dose. (600w light=about 600 ppm for full feeding). I use filtered 'city' water so I am starting with 114 ppm (of something) before adding nutrients. I do not use co2. Also, I don't believe that it is said enough that a nutrient deficiency (with todays high end nutrient lines) may very well be compounded by adding more nutrients since there is a very good chance that something else, such as cold or PH, caused to plant to reject available nutrients. These are just the thoughts of a new grower who has been chasing his tail by putting too much faith is what I read and what I see on YouTube. As I learn more, I want to suggest that if you are new like me there are a few must do's. You must have a PH and PPM meter (cheap ones are just fine). You must have a bottle of 7.0 liquid and calibrate your PH meter weekly. You must keep your coldest temperature of the day at 65F or higher. You must monitor the PH of everything you do. You must be patient.